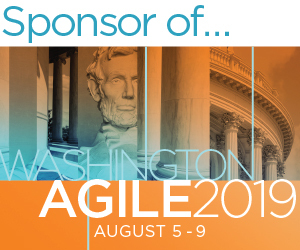 Thank you for your sponsorship of Agile2019! This webpage will serve as your “home base” for Agile2019 Sponsor information. Information will be added and updated on this page throughout the planning process. Sponsor Logistics Emails have been sent out from Paula Spizzirri with information exclusive to your Agile2019 sponsorship. This includes Booth Numbers, Registration Codes, and DriveHQ Dropbox Login Information. Should you have any questions about your sponsorship deliverables at Agile2019, please contact our Logistics Manager, Paula Spizzirri at paula@agilealliance.org. Looking forward to seeing you at Agile2019 in Washington, DC! Below includes all key Dates & Deadlines for Sponsor Deliverables for Agile2019. Book Accommodations at the Gaylord National Resort & Convention Center. Note: We expect the hotel to sell out. Room quantities and date availability is based on first come, first served basis. Sponsor Logistics Email sent from Logistics Manager, Paula Spizzirri. This email includes information exclusive to your Agile2019 sponsorship. This includes Booth Numbers, Registration Codes, and DriveHQ Dropbox Login Information. Materials arriving after July 29th will be subject to an additional after deadline charge from Freeman. Warehouse accepts materials Monday through Friday between 8:00 - 15:30. Note: Materials arriving after 15:30 on August 2nd are not guaranteed. NO Shipping Day - Materials will not be received at either the Freeman Warehouse nor Show Site. Note: Shipments arriving before this date may be refused by the facility. August 5 - 9, 2019 @Agile2019! Registration instructions and discount codes were included in the Sponsor Logistics Email. ALL sponsors must register using the unique registration link included in the email. Additional Discounted Passes: These are available on first come, first serve basis. Discount codes were included in the Sponsor Logistics Email. All Registration Tickets include full access to Agile2019 [Meals, Sessions and Special Events]. There are NO booth only passes. We encourage all sponsor attendees to participate and network in all conference activities. DEADLINE: As soon as possible, as we expect the room block will sell out! Call Reservations at +1 800.228.9290 and indicate you are part of "Agile2019"
We expect the hotel to sell out. Please book as soon as possible. Room quantities and date availability is based on first come, first served basis. If the hotel sells out, you may subject to a higher room rate. Please use the link provided. Reservations made directly through the general hotel website may be subject to a higher rate. All reservations must be secured by a valid credit card and a deposit of (1) nights’ accommodation will be charged at the time of booking. Please beware of potential house scams. Occasionally, we have become aware attendees of the Agile20XX Conference having been contacted by Housing Scam companies such as Exhibitor Housing Services [EHS] claiming that they have hotel rooms blocked at our host hotel for lower rates than our negotiated conference rate. They also may be claiming that our room block is almost sold out and are insisting that you need to reserve your hotel room(s) through using their services as soon as possible. They will insist on taking your reservation and that you pay up front by credit card. These representatives/companies do not represent Agile Alliance nor the Agile2019 conference, nor have they been authorized to use our name or trademarks. If you are contacted by anyone from this company, please exercise extreme caution and we encourage you to NOT REPLY to any communication from them.Using the services of such Housing Scam companies will NOT result in a reservation at the hotel and engaging with these companies could result in excessive charges or worse. To ensure you are booking hotel rooms for Agile2019 safely and securely, please make your hotel reservations using the dedicated hotel link or you may call the hotel directly at +1 800.228.9290. For additional hotel information click here. Logos will be used for sponsor recognition in the Program Guide, marketing materials onsite [print & digital] and the Conference T-Shirt. Logos must be saved in Adobe Illustrator CS (saved as .eps or ai formats) or Photoshop files (min. 300 dpi). Note: eps format is preferred. A customized DriveHQ dropbox link has been sent in your Sponsor Logistics Email from Paula Spizzirri. Must be press-ready Photoshop, Illustrator or Adobe Acrobat files (at 300dpi). Please include all linked or embedded images. All type must be outlined. Ads are produced in full color. Booth numbers are used for Exhibit Decor and shipping purposes only, we do not post booth numbers onsite, but rather full company names. Please do not include your booth numbers on marketing communications, your advertisement, etc. Freeman is our selected exhibit décor partner for Agile2019 and will be handling all exhibit booth details, equipment and supplies as well as shipping, freight and material handling. Their online system, Freeman OnLine® will allow you to customize your booth for the Agile2019 Conference as well as order other services including Audio Visual, Internet, Food & Beverage, Lead Retrieval and more! Freeman is an outside vendor and charges for all services. An email will be sent to you directly from Freeman to get you started on Exhibit Decor elements of the show. Note: Booth numbers have been sent in your Sponsor Logistics Email from Paula Spizzirri. Note: Any additional height requirements and/or hanging signage must be approved by Agile Alliance. Please contact Paula Spizzirri. Booth numbers have been sent in your Sponsor Logistics Email from Paula Spizzirri. IMPORTANT: Booth numbers are used for Exhibit Decor and shipping purposes only, we do not post booth numbers onsite, but rather full company names. Please do not include your booth numbers on marketing communications, your advertisement, etc. 8' high backwall & 3' high side drape - Note: Any additional height requirements and/or hanging signage must be approved by Agile Alliance. Please contact Paula Spizzirri. Should you wish to add/customize your booth, please work with our Exhibit Decor partner, Freeman. Freeman is full service Exhibit Decor provider and is able to create, customize and manage all of your Exhibit Decor requirements. The Sponsor Exhibit space is located in the Prince George Exhibit Hall C, Convention Center (level 1) of the Gaylord National Resort Washington. Click Here to view the general Gaylord National Resort Washington Floor Plans. The Agile2019 Exhibit Floorplan will be posted [and emailed] on July 8th. Freeman will be managing all shipping, material handling and transportation. Conference Bags will be collated in the early morning on Sunday, August 4th. We will not be responsible for items which are not shipped properly. GET CREATIVE! What better way to get your company and message out to the Agile2019 Conference attendees, than to put something unique they will remember in the bag! In order to ensure all bag inserts are appropriate and not duplicated, we require all sponsors to send us a description of the item you are including in the bag to Paula Spizzirri by DEADLINE: June 28th. IMPORTANT: Booth numbers are used for exhibit decorator [Freeman] and shipping purposes only, we do not post booth numbers, but rather full company names. Please do not include your booth numbers on marketing communication, your advertisement, etc. The suggested quantity for the number of inserts to include in your shipment is 2500 pieces. A bag insert may be printed material or SWAG. Conference Bags will be collated in the early morning on Sunday, August 4th. To ensure we have all of the bag insert set aside for this activity, we require tracking numbers for bag insert materials to be sent to Paula Spizzirri no later than July 22nd. Let the World Know You’re an Agile2019 Sponsor! Post your Sponsor Badge on your websites, social media sites, blogs, emails etc. DEADLINE: Agile Alliance will begin accepting Sponsor Email Content beginning July 8th until September 9th. Title, Platinum, Gold & Silver Sponsors are entitled to one email message sent to Agile2019 attendees on your behalf [Attendees may opt out]. Subject Line and the Date in which you would like the email to be sent. Note: We will do our best to send email out on requested date but it is not guaranteed. Please test in all intended recipient formats. We will not run test emails. Show Daily email each morning before the conference day begins. News copy - limited to 50 words (300 characters). You may include hyperlinked text. DEADLINES: 1 PM Eastern Time, the day before the distribution date.